The first entry in Thoreau’s “Field Notes of Surveys” dated November 1849 contains comments describing a survey of Isaac Watt’s Woodlot. 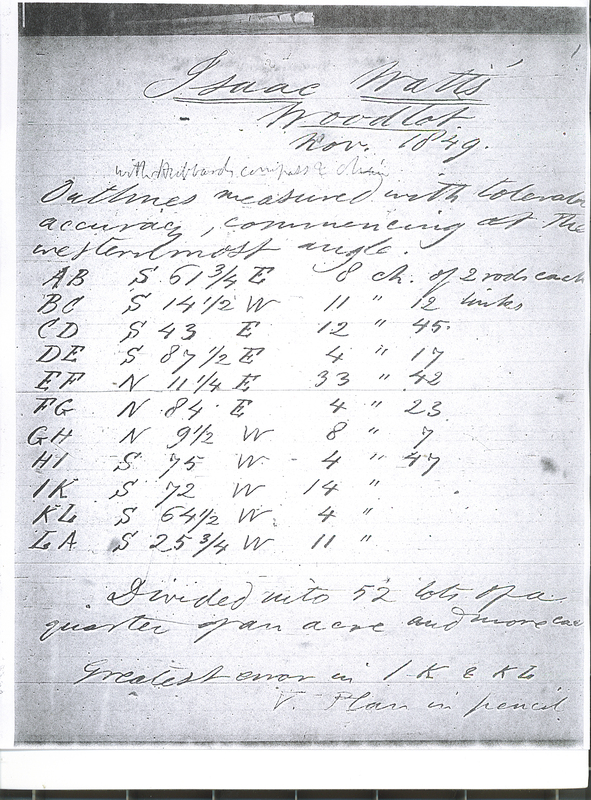 The survey image includes a worksheet on which Thoreau listed and then incorrectly computed the total area for 14 odd shaped lots as = 907 square rods (907 /160=5.66 acres). By my calculation the correct sum of the data for the 14 odd shaped lots listed is 947 square rods=5.91 acres, a difference of 40 square rods or a 0.25-acre under count by Thoreau. In addition, Thoreau identified 38 uniform quarter acre lots/4=9.50 acres. Grand total area = 9.50 uniform quarter acre lots plus either 5.66 acres or 5.91 acres odd shaped lots = 15.56 or 15.41 acres, a difference of 0.25 acre. (All but one of the odd shaped lots was more than a quarter acre.). In summary, Thoreau undercounted the total acreage of Isaac Watt’s Woodlot by 0.25 acres on his worksheet, but his survey map is correct. Thoreau only said he surveyed 52 lots which is true and the average lot size for the combined quarter acre 38 uniform shaped lots and 14 odd shaped lots equals slightly more than 15 acres, just as Thoreau described “52 lots of a quarter of an acre and some cases more”. So although Thoreau’s table of odd shaped lots appears to contain an undercount error of 40 rods or 0.25 acre the error as a percent of the total area is small (0.25/15= 1.7%) and the map contains other known inaccuracies such as Thoreau notes that “Greatest error in IK & KL” which appears to be a zone edge approximation along its Virginia Road boundary across the road from Thoreau’s birthplace and current Headquarters of the Thoreau Society. Nevertheless, Thoreau had recorded a survey of “52 lots of a quarter of an acre and some cases more” for Isaac Watt’s Woodlot during November 1849. I am currently attempting an independent transcription of the Thoreau Field Notes, and your quote for the beginning of Thoreau’s text, on page one, is not what I would agree with– I read it as: “outlines measured with tolerable accuracy, commencing at the westernmost angle” and not as you quote the text in your web log. I have found many such differences between how I am transcribing the field notes, and how you have transcribed them, in many other passages throughout your Illustrated and Chronological web pages citing the Field Notes contents. So, as a like-minded companion and co–enthusiast in exploring Thoreau’s surveys, I’d like to propose that we conduct a joint effort at a new text of the Field Notes, and submit this to the senior editor, Elizabeth Witherell, of the Writings of HDT (at UC Santa Barbara), with whom you have established a scholarly relationship. I think this would be an enjoyable collaboration, so let me know what you think. Allan, Great! I think this will be more fun with two of us… and less nerve wracking trying to sort out obscurities in Thoreau’s Field Notes. I think we should try this: since Thoreau’s handwriting is difficult, if we each transcribe say 5 pages at a time, and trade transcripts via email– then follow that up with Word track changes to show tentative revisions, volleying back & forth via email to reconcile the differences. As a test page, let’s do page 119 (originally numbered 115)– I will send my transcription to you in half an hour (via email), using the courier font with interlining text on a separate lines, as done for the Princeton Journal transcriptions. O.K. but I noticed that pages 112-115 are missing from my online collection. I checked through all of my collection and there are about a dozen missing pages. I will return to the Library and attempt to obtain copies of the missing pages so that my online data matches the original on file at the library.